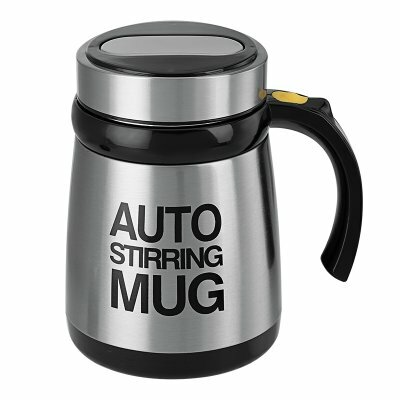 Successfully Added Automatic Stirring Mug - 400ml, 2x AAA Battery, Stainless Steel, Multifunctional to your Shopping Cart. This Auto Stirring Mug is a fun little gadget that allows you to stir and mix up your drinks with just the touch of a button. With its 400ml capacity, this electronic gadget holds plenty of your favorite drink, allowing you to sit back and enjoy a well-stirred delight. Additionally, the Auto Stirring Mug comes with a screw lid thanks to which it lets you carry along your freshly stirred juice, milkshake, coffee, or soup anywhere you go. Crafted out of durable PC and stainless steel material, this multifunctional electric stirring cup has been built to take a hit – taking away all your fears of leakages while carrying it along in your bag. Besides using it to carry along your favorite drinks and beverages, this automatic stirring cup can additionally be used to scramble eggs, mix yogurt with oatmeal for breakfast, and stir up powdered milk, coffee, and soups in a convenient manner. Being truly multifunctional, this cool electronic gadget is a fun tool to have at hand in the office or your kitchen as it is guaranteed to make your life more convenient. From now on you’ll never have to bring along a spoon again as, with this electric stirring cup, all you have to do is press a button and you’ll be all set to mix, scramble, and stir. Powered by two ordinary AAA batteries, this fun little gadget brings along countless hours of usage time. With its strong power, it is capable of mixing a wide variety of ingredients, ranging from regular liquids such as coffee to thick soups, milkshakes, and yogurt oatmeal. Simply fill it up with your favorite drink, soup, or beverage, mix it, and enjoy a fresh drink at any time of the day. This Auto Stirring Mug comes with a 12 months warranty, brought to you by the leader in electronic devices as well as wholesale electronic gadgets.. SOLID ,LOOKS FANTASTIC, WORKS BETTER THAN I THOUGHT "READ THE INFOMATION ABOVE PLEASE", ALL THAT CHINAVASION SAIS IS ALL TRUE, COFFEE,EGGS,SMOOTHIES, ECT.. I ONLY WISH I HAD PUT MORE IN MY ORDER ,IT WONT SPILL IN THE CAR OR RIDING A BIKE ,STAYS HOT OR COLD ITS ALL UP TO YOU, SO DON'T JUST GET 1 IF YOUR A RE-SELLER,OR AS GIFTS TO FAMILY AND FRIENDS..